Our team take to the streets, keeping you up to date with the latest happenings - Were you lucky to receive a Capital freebie?! 1. Out and About with our Street Stars! 2. Out and About with our Street Stars! 3. Out and About with our Street Stars! 5. Out and About with our Street Stars! 6. Out and About with our Street Stars! 7. Out and About with our Street Stars! 8. Out and About with our Street Stars! 9. Out and About with our Street Stars! 10. Out and About with our Street Stars! 11. Out and About with our Street Stars! The Heart Angels welcomed shoppers to the new B&Q store opening in Spalding offering face painting and Heart goodies! 13. Out and About with our Street Stars! 14. Out and About with our Street Stars! 15. Out and About with our Street Stars! 16. Out and About with our Street Stars! 17. Out and About with our Street Stars! 18. Out and About with our Street Stars! 19. Out and About with our Street Stars! 20. Out and About with our Street Stars! 21. Out and About with our Street Stars! 22. Out and About with our Street Stars! 23. Out and About with our Street Stars! 24. Out and About with our Street Stars! 25. Out and About with our Street Stars! 26. Out and About with our Street Stars! 27. Out and About with our Street Stars! 28. Out and About with our Street Stars! 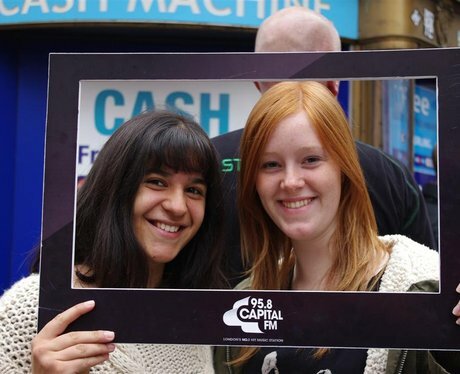 Our street stars were out and about in London - were you lucky enough to receive a Capital FM Freebie?! 58. Out and About with our Street Stars! 59. Out and About with our Street Stars! 60. Out and About with our Street Stars! 61. Out and About with our Street Stars! 62. Out and About with our Street Stars! 63. Out and About with our Street Stars! 64. Out and About with our Street Stars! 65. Out and About with our Street Stars! 66. Out and About with our Street Stars! 67. Out and About with our Street Stars! 68. Out and About with our Street Stars! 69. Out and About with our Street Stars! 70. Out and About with our Street Stars! 71. Out and About with our Street Stars! 72. Out and About with our Street Stars! 73. Out and About with our Street Stars! 74. Out and About with our Street Stars! 75. Out and About with our Street Stars! 76. Out and About with our Street Stars! 77. Out and About with our Street Stars! 78. Out and About with our Street Stars! 79. Out and About with our Street Stars! 80. Out and About with our Street Stars! 81. Out and About with our Street Stars! 82. Out and About with our Street Stars! 83. Out and About with our Street Stars! 84. Out and About with our Street Stars! 85. Out and About with our Street Stars! 86. Out and About with our Street Stars! 87. Out and About with our Street Stars! 88. Out and About with our Street Stars! 89. Out and About with our Street Stars! 90. Out and About with our Street Stars! 91. Out and About with our Street Stars! 92. Out and About with our Street Stars! 94. Out and About with our Street Stars! 95. Out and About with our Street Stars! 96. Out and About with our Street Stars! 97. Out and About with our Street Stars! 98. Out and About with our Street Stars! 99. Out and About with our Street Stars! 100. Out and About with our Street Stars! 101. Out and About with our Street Stars! 102. Out and About with our Street Stars! 103. Out and About with our Street Stars! 104. Out and About with our Street Stars!